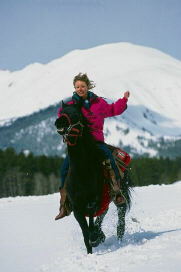 Riding holidays: faster work, cantering, galloping, possibly even jumping. Visiting places of interest relating to horses. In France, for instance, there are the National Stud Farms to visit. You stay on your feet and walk. Enjoy equestrian displays, such as the Spanish Riding School of Vienna or the Cadre Noir You sit, watch and admire! For those with disabilities or special needs, Riding for the Disabled may be of interest. They offer horse riding or carriage driving to people with disabilites, giving you the opportunity to improve your health and wellbeing, and confidence. They've been going for 40 years & aim to develop and support opportunities for achievement and therapy, while enabling opportunities for exercise and enjoyment. You can find an RDA branch near you here. They also offer holidays for RDA Group Members - a great way to enjoy a break away from being at home and having fun with like-minded people. They are always willing to hear from volunteers to help out, too. You can find a riding school to learn at by visiting the British Horse Society and finding one of their approved riding schools & instructors. Be honest about your weight so that the school can be sure it has a horse for you. Be honest about your experience. Two hours in the saddle does not make an experienced rider, more of a beginner. Check to see what equipment is available for hire from the school - do they provide hard hats, for instance? One of the great unknowns about riding horses is that you get a terrific view of other people’s gardens. These views can give you some great ideas for your own! "A canter on a horse is a cure for every ill."
Horses are very emotional animals. They do unpredictable things. To progress and push back the boundaries, you will fall off. Falling off and getting back on again is a key lesson to learn in life. Be willing to come a cropper, and you’ll find a wonderful world open up to you. Take courage in both hands, find it in your heart and go outside of your comfort zone. Fall off, welcome the experience - and get back on and have another go.